Sittin 'n Knittin: Summer of Socks Start **with Rockin' Sock Club spoiler!! Summer of Socks Start **with Rockin' Sock Club spoiler!! Just a quick post to show I've started my SOS projects! First up, completed toes for what will be a pair of plain anklet socks. Perfect car knitting. The yarn is Regia Bamboo color 1067, a skein I picked up when I went up to the lil' ol' get together Webs hosted for a certain Northern Gal a few weeks ago. (Yeah, I know, I never mentioned it. Nor did I mention that the trip to The Cape turned into a trip to see the in-laws in NH because of the crap weather on The Cape, enabling me to stop by the Webs tent sale. I'll post loot pix one of these days!) Next up, the Blue Moon ladies have done it again. This was waiting for me when I got home from work Thursday. A colorway I never would pick up myself, yet really love how it knits up! 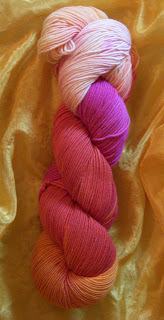 Rockin' Sock Club June kit, STR lightweight colorway Firebird. The June offering is a slip stitch cable pattern, easily completed without a cable needle. It seems to be moving along fairly quickly and I'll be starting the gusset increases in another inch! In accordance with the bylaws of SOS07, none were started prior to 5am Thursday, 6/21. 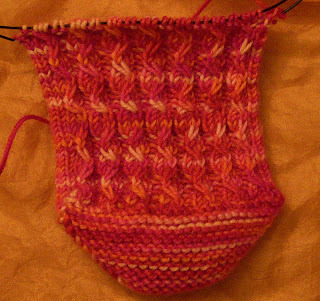 The Solstice Slip sock was cast on Thursday night, the bamboo anklets Friday afternoon. Tomorrow presents lots of good car knitting, hopefully I'll have some good progress to show!